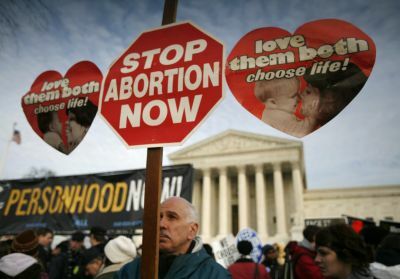 UPDATED – WASHINGTON (CNS) — On a chilly and cloudy morning on the National Mall in Washington, crowds gathered Jan. 22 for the annual March for Life, this year marking the 42nd anniversary of the U.S. Supreme Court’s Roe v. Wade decision legalizing abortion virtually on demand. Tens of thousands gathered first to hear a lineup of speakers, before marching from the Mall up Constitution Avenue to the U.S. Supreme Court building on Capitol Hill. Early in the day, Pope Francis showed his support of the pro-life gathering by tweeting the theme: “Every Life is a Gift” with the hashtag #marchforlife. By late morning, the temperature had reached about 40 degrees, warmer than many a previous march, and a music group opened the rally with the songs “To Be Loved” and “You’re Not Alone.” The music was upbeat with lively mandolin licks and the powerful voice of the lead singer. Several members of Congress were in attendance, including U.S. Rep. Tim Huelskamp, R-Kansas, who told Catholic News Service, “I am here to make my colleagues listen.” Huelskamp said life is a core issue in the public debate, and that Kansas was already at the forefront of human rights issues. “They were at the forefront of the slavery issue,” he said, and are now at the forefront of the life issue. Jeanne Monahan-Mancini, director of the March for Life, addressed the marchers, congratulating them for making a “pilgrimage” before focusing on this year’s theme. “Every Life Is a Gift” emphasized that every life is a gift, regardless of a person’s difficulty or disability, and also was meant to emphasize that everyone has a call and a mission — and a role to play creating a culture of life. A large congressional delegation in attendance emphasized the importance of the Health Care Conscience Rights Act before yielding the floor to a passionate and energetic address by Sen. Tim Scott, R-South Carolina, who said the defense of life was “the responsibility of every single person in America.” The conscience bill would implement a broad religious exemption and conscience protections for private employers who oppose the federal contraceptive mandate that is part of the Affordable Care Act. As a member of “the pro-life generation,” she said she was proud to have come alongside “400 pro-life warriors,” referring to the school bringing its entire student body on the 1,300-mile journey to the march. “Our generation has seen through the smokescreen of lies and secrets,” she added. The president of Students for Life, Kristan Hawkins, discussed the gift of her son’s life despite a diagnosis of cystic fibrosis. Hawkins said, “I have personally witnessed the push in our culture to create ‘perfect’ babies.” she said. After the rally, the crowd left the Mall for Constitution Avenue and marched up to the Supreme Court. 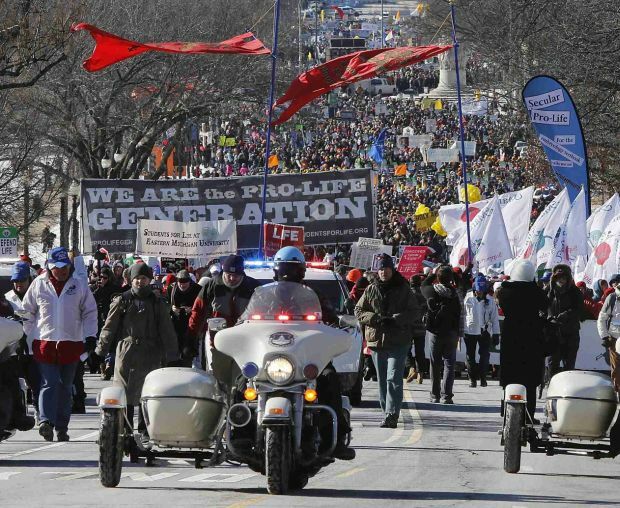 At the front, carrying the March for Life banner, were students from three North Dakota Catholic high schools — Shanley in Fargo, St. Mary’s in Bismarck and Bishop Ryan in Minot. Among the marchers was a delegation led by Archbishop Timothy P. Broglio of the U.S. Archdiocese for the Military Services. The group included Catholic cadets from the U.S. Military Academy at West Point, New York. As the pro-lifers reached the Supreme Court, a small of group demonstrating in support of keeping abortion legal tried to stop them. The protesters held signs that read, “Abortion on demand and without apology.” At least eight were arrested by the U.S. Capitol Police for blocking the marchers’ path. Among events on the anniversary of Roe was an early morning prayer service held at Constitution Hall before the march and rally. It was organized by the National Pro-Life Religious Council, the National Pro-Life Center on Capitol Hill, Faith and Action, and Priests for Life. Just as Jesus prayed that all would be one, “the Lord wants us to come together ‘as one,’ committed in the same faith and love for the unborn,” said Father Denis Wilde, associate director of Priests for Life. The National Council of Catholic Women continued its decades-long tradition of participating in this year’s March for Life and related events. “Our voices must be heard throughout the country in defense of life, traditional marriage, religious liberty and many other issues that affect our ability to practice our Catholic faith,” commented Rebecca Woodhull, NCCW president. In an interview with CNS a day before the march, Scott, the South Carolina senator, had predicted it would be a “fantastic experience,” adding that his foundation in religious faith informs his position on life. Scott has talked often about facing adversity in his own life, growing up in poverty, and how he would have made bad choices if a mentor had not intervened and put him on a path to success.